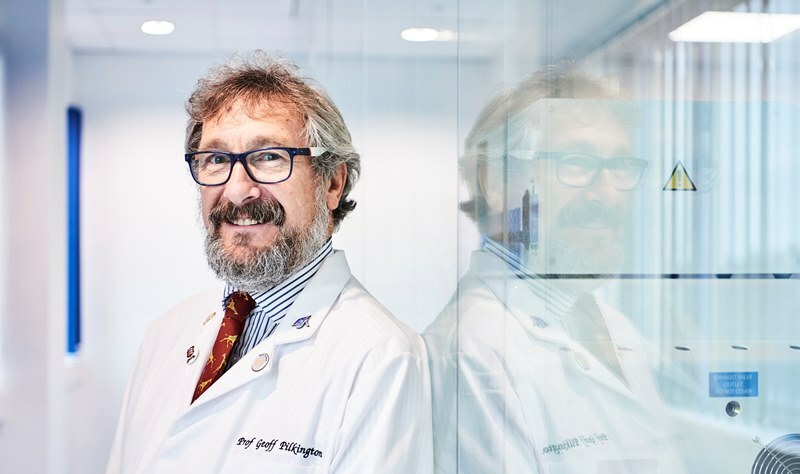 Animal Free Research UK are funding Professor Geoff Pilkington at the University of Portsmouth to develop better ways of treating patients with brain tumours. 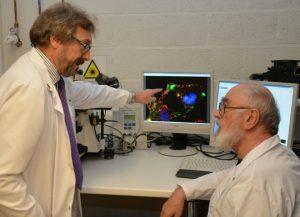 We caught up with him to discover more about the scientist behind the all-human brain tumour research. Why is your research necessary? Our work on brain tumours is essential because the brain controls the rest of the body and any tumour or cancer within the brain will adversely affect the patient but in many ways. Brain tumours are much more common than is perceived and research in this field is notoriously poorly funded. Many brain tumours carry a dreadful prognosis and we have not been able to substantially change the dismal outcome for these patients for 50 years. What is the biggest achievement of your research so far? We have engineered the most sophisticated in vitro blood-brain barrier reported to date and it is comprised wholly of human cells and proteins, thus reflecting the biological features of the in situ human brain far more accurately than other animal and in vitro models. Since the publication of our latest paper on the blood-brain barrier model, we have been inundated with communications from other scientists all over the world who wish to use our models in their own studies on different diseases in the brain. I became passionate about doing something scientific that may help patients suffering from devastating diseases. Sadly, eight years into my brain tumour research career, my mother was diagnosed with a malignant brain tumour in 1979. She survived for only 16 months. This period showed me the ‘other side of the counter’ and enabled me to empathise with patients and carers alike, as well as being a dedicated brain tumour researcher.Why are you conducting animal free research? Why are you conducting animal free research? Early in my career, live animal experiments were ‘the norm’; in vitro work was rare and scorned by many. However, I had major concerns about being able to replicate the precise biology of the human brain and its diseases in rat and mouse models. Once I had established my own research group, I began growing cells from brain tumour patient biopsies and studying their biology using new cellular and molecular techniques. I believe that this investment in time has helped in bringing these studies to the forefront – achieving both the replacement of animals in science, as well as gaining a sounder representation of the diseases we seek to treat. Do you encounter any barriers because you don’t use animals? Yes, this is a major problem. In vitro work is often expensive and painstaking but I feel that the cost will reduce with the more research that is carried out. It is also very difficult to get our solely in vitro research findings published in top journals, as they regularly state that we need to ‘validate’ our in vitro findings through animal models. In fact, we have been asked by a number of research groups to help them ‘validate’ their animal model studies with our in vitro studies! Do you find that the replacement of animal use in biomedical research is becoming more accepted in the scientific community? Yes, actually, at last, I do. The level of sophistication of the in vitro systems now available to us has given the scientific sector the enthusiasm and impetus to concentrate on these non-animal approaches. I believe we are getting ever nearer to gaining acceptance of such technologies in pre-clinical testing. Did you always want to be a scientist? No. I really enjoyed biology at school and had a wonderfully eccentric teacher, who first instilled in me a fascination for the life sciences, but I didn’t really know what to do as a career. It was only when I got a job as a technician in a medical research laboratory that I knew I really wanted my own laboratory, so set my sights on gaining the qualifications necessary to achieve this goal. What advice would you give someone who wants to go into animal free research? Spend some time in my labs, to gain an experience of what it’s really like to work in a laboratory of non-animal medical research. We try to host as many A-level and undergraduate students as we can realistically support each year. Playing cricket (keeping wicket and batting), watching rugby union, taking the dog for a walk on the beach or in the woods, chugging around the Solent on my little boat, drinking real ales and good red wine, and visiting the Greek islands (I think I’ve been to around 40 different ones to date). If you weren’t doing research, what would you be doing instead? 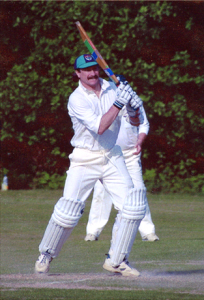 In my dreams, being a double England international at both rugby and cricket. In reality, I’d probably be a journalist of some type. You can help Geoff beat brain tumours by making a kind donation today. If you’ve supported us for a while, you may remember that we were originally planning to partner with another charity to share the costs of this exciting project. Since then, there have been changes in the way some brain tumour research is funded in the UK which unfortunately put the project at risk. Animal Free Research UK is completely committed to this ground-breaking research so has stepped up to fund 100% of the costs. If you can, please make a donation today to help with the additional £50,000 we need to complete this pioneering animal free research. With your help, we can find better ways to fight devastating brain tumours. If you are a UK taxpayer, the value of your gift can be increased by 25% under the Gift Aid scheme at no extra cost to you. This means a donation of £10.00 could be worth an extra £2.50 to us, and it doesn't cost you a penny.